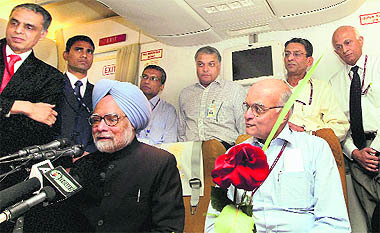 While returning to Delhi on Friday afternoon after participating in the 16th summit of the Non-Aligned Movement (NAM), where he was feted and honoured, Prime Minister Manmohan Singh appeared intensely aware that the Parliamentary storm that raged when he left for the trip had far from abated and that he continued to face opprobrium from the Opposition parties over the so-called Coalgate issue. Samajwadi Party chief Mulayam Singh Yadav�s attempts to forge a Third Front around the ongoing coal blocks allocation controversy failed today with the Biju Janata Dal (BJD) and the AIADMK refusing to support his strategy. The BJP today took a dim view of the demonstration by Samajwadi Party leader Mulayam Singh Yadav and some other parties in support of their demand for a fair probe and debate in Parliament on the CAG report on coal block allocations, describing those who participated in the �dharna� as the �B Team� of the UPA government. The main Opposition party strongly condemned the criticism of the CAG by Congress general secretary Digvijay Singh, accusing the ruling coalition of making a mockery of constitutional institutions. DELHI: Want to convert property? Apply online now! In a jolt to the Sahara Group, the Supreme Court today directed two of its companies, Sahara India Real Estate Corporation (SIRECL) and Sahara Housing Investment Corporation (SHICL) to refund Rs 24,029 crore they had collected in 2008-09. Punjab Deputy Chief Minister Sukhbir Singh Badal has asked the Inspector General of Jalandhar Zone to conduct a thorough inquiry into the death of a college girl who ended her life yesterday after being �harassed and humiliated� by the police and some photojournalists. A special court today awarded life imprisonment to BJP MLA Maya Kodnani, Bajrang Dal leader Babu Bajrangi and 29 others for the 2002 riots here at Naroda Patiya where 97 persons were killed. Come Saturday, and love will be talk of the town in conservative Kashmir. For two consecutive days, young men and women in Srinagar will break taboos to discuss religion and romance and that too on a common platform. The occasion would be a seminar on �Marriage and its Ethics� at Ibn Khaldun auditorium on the Kashmir University campus.